Clothing will always give an introduction before you even open your mouth to speak. It is your billboard to the world, declaring your emotion and thoughts for the day. Hair is the one accessory that you wear on a daily basis so that should reflect your style as well. I would venture to guess that many of you have selected Salon Enso as the place to get your hair done as we listen to your expectations and craft a cut based specifically with you in mind. Not all salons do that. There can often be a cookie cutter approach to hairstyling and if there is one thing we know for sure, one size and one hairstyle does not fit all. I’m not sure when exactly it began, but I began avoiding the mall. Sometime in the last year I felt my interest wan in a place I knew like the back of my hand. I know I do not want to be anywhere near it come holiday time – because unless it is a concert, I have no desire to be elbow to elbow with people in a tight space. I guess that in addition to the crowds I got a little tired of seeing the same things over and over and over again. I was also noticing steep price increases for clothing that had decreased in quality. I felt a little stuck – basically like I was trying to make that one size fits all fit my vibe. Then cue last summer when a boutique named Sophie Stargazer began following me on social media and I followed back. I was intrigued. That interest led me one warm July day to wander downtown for a popup shop by a local handbag designer (handbags and shoes are my biggest weakness). I went expecting to look at bags – what I didn’t expect was to fall in love with shopping all over again. 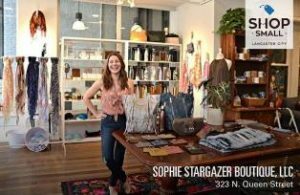 I was very warmly greeted when I entered the store by Kristin, the owner of Sophie Stargazer. This is a gal who has poured sweat and sparkle into every corner of her shop and it shows. Big windows let in an abundance of sunlight in a space that feels light, open and inviting. Kristin talked to me about her store and her ethos for the products she carries which are either eco conscious, ethically made or from a local vendor (such as the Crystal Kodada bags she was showcasing). Those are some beautiful standards, especially considering fashion can be a very disposable industry and so much emphasis is put on mass merchandising. It was refreshing to meet someone from the Lancaster county area that wants very much to see other local entrepreneurs and businesses succeed. I’ve since frequented Sophie Stargazer and have never left empty handed. I enjoy finding unique pieces for myself, friends and family. The other boutiques are Nicole Taylor, Telltale Dress and Primitive Threads. Each of these boutiques also shines in terms of amazing clothing, accessories, trinkets and home goods. They also have some very stellar, strong and sweet females who more than jumped at the chance to participate in a benefit for clean water. Friday April 6th, 2018 will see Salon Enso partnered with all of the wonderful boutiques within the Keppel Building in honor of Earth Month. We invite you to come and party with us at Earth Month First Friday with Enso as we raise money for Clean Ocean Action. We will have our henna artist Keisha on site in Nicole Taylor, a braid and lip bar in Primitive Threads, hand and scalp massages at Telltale Dress and oodles of information about Salon Enso and Clean Ocean Action at Sophie Stargazer. We also invite you to take time to check out each of these amazing boutiques, their wares and of course speak to their rock star owners. The proceeds from all donations will go to Clean Ocean Action which helps keep the waterways and our local beaches clean. Come out and hang with us! Chitchat, try on a new lip color, top, jacket, hat and a”dress” your wardrobe with some fresh finds. Or get inspired to spring into a brand new look all while you are donating green to make the world green. Who knew all the good a little retail therapy could do?